Cigar aficionados rejoice! These cruise ship cigar lounges will become your new favorite thing! Cigar lounges have played an important role in American history from cinema appearances to private lounges in major cities enjoyed by many. 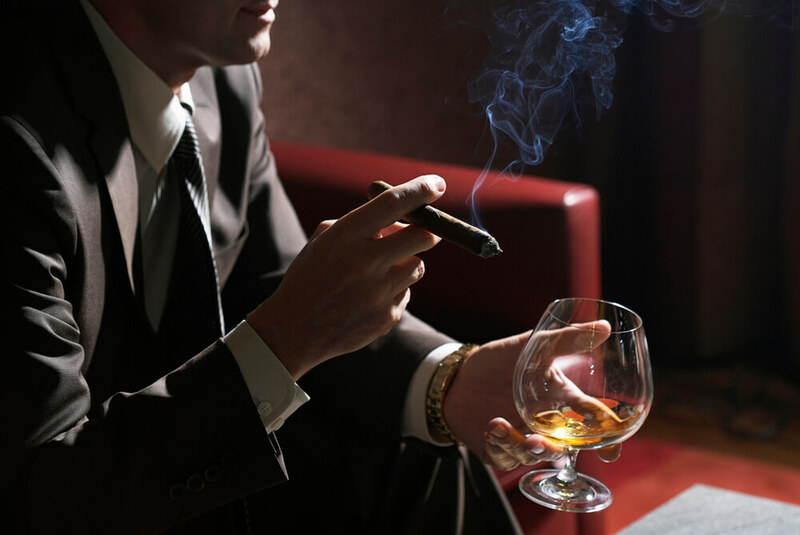 Cigars have always been classier than cigarettes and lounges dedicated to the cigar smoker bring up thoughts of leather chairs, a relaxed atmosphere, and one’s favorite alcoholic beverage. As in the past, today’s cigar aficionados talk and learn about cigars, share stories, and enjoy a good smoke during their visit to cigar lounges. For those that enjoy a fine cigar and cruises: are you aware there are a number of cruise ship cigar lounges? These classic spaces are specifically designed for cigar smokers. The true cigar aficionado will immensely enjoy the experience of a cruise ship cigar lounge and will be especially thrilled combining said experience with sights of cigar rollers and history in port stops throughout the Caribbean. CruiseExperts.com has all the information on cruise ships that go to Cuba, Puerto Rico, and other Caribbean destinations where cigars are prevalent, as well as other sailings that have cruise ship cigar lounges available. Here at CruiseExperts.com, we want to provide our clients with all the information they need to plan the perfect cruise so we have put together a list of popular cruises with cigar lounges. The Holland America Line’s cruise ship Noordam provides the Oak Room for cigar and pipe smokers only. Cunard’s offers Churchill’s comfortable cigar lounge on Queen Mary 2, Queen Elizabeth, and the Queen Victoria. Both Cuban and Dominican cigars are available for purchase. The MSC Divina has a large beautiful cigar lounge with comfortable seating, large windows, and a bar where you can purchase your favorite beverage to enjoy while you smoke. Royal Caribbean offers the Connoisseur Club on the Freedom of the Seas, Mariner of the Seas, and Liberty of the Seas for their cigar-smoking guests. Norwegian Cruise Lines provides its guest on the Bliss, Joy, Escape, Getaway, and Epic ships with a Humidor room to enjoy their cigars. You can purchase cigars in the lounge. Princess Cruise lines has a Churchill’s lounge where guests can relax and enjoy premium cigars in comfort. Regent Seven Seas has a Connoisseur Club, which is a cigar and cognac lounge. Once the ship is in international waters, Cuban cigars are also available. Crystal also offers a comfortable Connoisseur Club for cigars and cognac where you can purchase premium brands. Silversea’s Connoisseur Corner invites guests to enjoy cigars and cognac while seated in very comfortable low-slung leather chairs. Cigar lounges on the ships that provide them are comfortable and cozy, provide a relaxing atmosphere, premium brands of cigars, and allow you to bring in your favorite beverages to complete the setting. Most have darker masculine decorative tones and some feature wood and leather. They are reminiscent of the private men’s clubs of the last century. Cruise lines try to provide special comforts for all their guests, and cigar lounges are appreciated by many.